Avon, Indiana is a great place to live, so great that it was actually chosen by Money Magazine as the “17th best place to live in America”! This city takes pride in providing its residents with a nurturing, family-friendly atmosphere as well as taking the necessary steps needed to protect the natural environment found in Avon. To help keep Avon a great place to call home, turn to the local pest control experts at Action Pest Control. Our QualityPro certified team can provide the environmentally friendly services that are needed to keep any Avon home or business free of dangerous, damaging, and potentially disease-spreading pests. Contact us today, to learn more about which of our pest control services are the perfect solution for your residential or commercial pest-related needs! Contact us today to learn more about any of our environmentally friendly home pest control programs and which is the right choice for your Avon, IN residential property! Remove overgrown vegetation and piles of wood and other debris that spiders like to hide in. Seal all entrance points into your home. Caulk gaps found around exterior windows and doors, replace torn door or window screens, seal cracks in your home’s foundation, place tight-fitting covers over all vents, and seal the spaces found around pipes, wires, and other utilities that are entering into your home. Insects are attracted to light, spiders are attracted to insects. Turn off outdoor lights as much as possible or switch from white light bulbs to yellow or LED bulbs which are less attractive to insects. Inside keep storage areas in your home free of clutter and debris. Put into place a year-round pest control plan from Action Pest Control to eliminate house spiders from your property and the plethora of house invading insects that are drawing the house spiders to your property and home. To learn more about our spider control services, give us a call at Action Pest Control today! Through our 10-step preventative commercial pest management program, the professionals at Action Pest Control can provide the services needed to keep your Avon commercial property free of damaging, disease spreading, bottom-line damaging pests! Our 10-step program includes inspection, monitoring, identification, sanitation, exclusion, harbor reduction, mechanical controls, environmental controls, product application, and documentation services. The combination of these carefully implemented steps and the dedication of our service professionals who are continuously being supported by supervisors, managers, and entomologists, is the superior way to protect your Avon business, employees, and customers from pests. At Action, we will work tirelessly to ensure that the environment found in and around your business is no longer attracting pests, that current pest problems are eradicated, and that future pest activity is being minimized and monitored. Contact us today to learn more about implementing a commercial pest control program from Action Pest Control into your Avon business. Protect your Avon, IN property from termites with the expert help of the professionals at Action Pest Control. We provide the comprehensive termite solutions needed to accurately determine the presence of termites and to completely eradicate them from a property as quickly and completely as possible. Our Five-Step Termite Control System includes a comprehensive inspection and the treatment of the infestation using Termidor®- a highly effective product that gets rid of termites through both ingestion and direct contact. Our professionals then follow-up with a three-month termite elimination inspection AND an annual termite inspection to make sure that your home is remaining completely free of wood-eating termites. We are so confident in the effectiveness of our termite control services that we also offer our customers a money-back guarantee and a damage warranty. 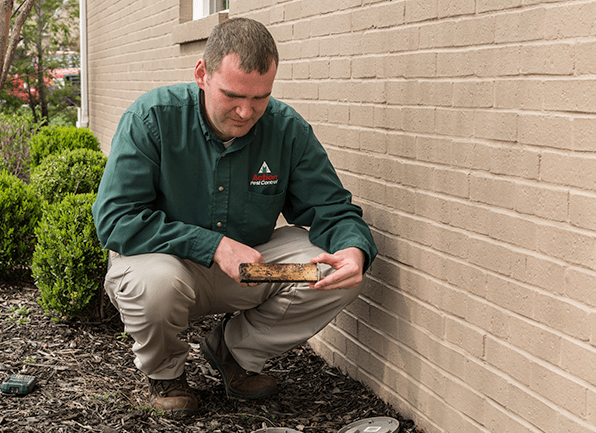 To learn more about our five easy steps to eliminate and prevent problems with destructive termites on your Avon property, call us today!